Yesterday afternoon, the Sacramento Bee posted a story about the possible removal of Assembly Republican Leader Connie Conway (R-Visalia). Conway led her caucus into the 2012 elections and into its smallest size since 1883. (In a ray of hope, while Republicans held 19 seats in 1883, the GOP gained 41 additional seats to reach 60 seats in 1885, thereby flipping a 61-19 majority for Democrats into a 60-20 majority for Republicans in two years). While Conway’s failings and probable removal were the main thrust of the story, the more interesting information for our readership is that the two leading contenders in the story to replace Conway are both from Orange County. 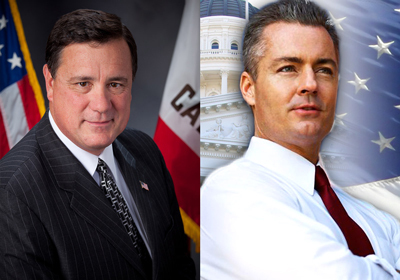 Second-term Assemblyman Don Wagner of Irvine and first-term Assemblyman Travis Allen of Huntington Beach were cited as the two most likely contenders. In either case, Wagner or Allen would be the first Assembly Republican Leader from Orange County in a dozen years. The next Assembly Republican Leader has exactly two priorities: protecting seats currently held by Republicans and winning seats occupied by Democrats. The top three seats the leader needs to protect are Jeff Gorell‘s Ventura County seat, Mike Morrell‘s San Bernardino County seat, and freshman Eric Linder‘s western Riverside County seat. Target #1 is the Antelope Valley seat held by freshman Steve Fox (D). Target #2 will be in the leader’s backyard (assuming Wagner or Allen is the next leader) with the North Orange County seat occupied by freshman Sharon Quirk-Silva (D). Failure to preserve the existing seats 25 seats and failure to gain either of those target seats will result in the next leader going the way of Conway, and let’s not forget Conway became Republican Leader when Martin Garrick stepped down after losing a Republican seat in 2010.